The Disney films are littered with so many references and connections I was surprised I was the first to try mapping them in one unified Disney theory. I hope you enjoy my Disney Theory. Theirs is a world where animals communicate verbally with one another (including with other species and a handful of gifted humans). It’s a place where man, beast and mythological creature regularly express their hopes and desires through song (if only to themselves), and where magic exists, and can benefit those who respect it, and punish those that don’t. Also, there are aliens. But what if I were to tell you that these were all characteristics of one coherent world? That every Disney film could be linked back to a single coherent timeline? That would be stupid, right? Well, obviously. So I’ve settled on 30. To catch a big-cat predator. Googling ‘Stoned Pumbaa’ can prove educational. ‘Disney Sniper’ is a dark game guys. 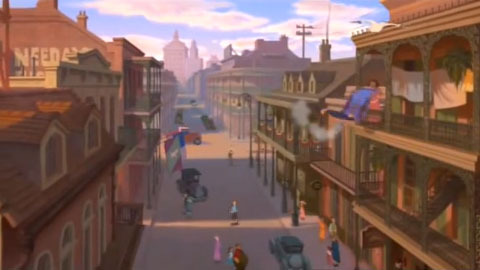 Here we have three Disney cameos in one: a screenshot-defying appearance of a Pumbaa-looking boar, carried on a spit; a trader shaking out Aladdin’s friend Carpet; and a clearly-defined Belle, ‘nose stuck in a book’, walking through Paris. Bambi’s mother – chilling in the clearing like she’s not the cause of countless childhood traumas. Come on! At least look at your surroundings before chowing down!! Dude, just enjoy this mother/son time while it lasts. Because here she is in The Rescuers, drinking 20th Century Bayou water with her soon-to-be-orphaned son (whose age corroborates that this is the same time-period as the early part of Bambi). So can Bambi’s mother travel through time? The answer comes later. Finding a Beast figure hidden among the Sultan’s tower of exotic creatures proves how far the myth of the cursed prince has travelled outside of Europe. For those keeping track, Carpet’s appearance in The Hunchback of Notre Dame means this is set before he finds himself in The Cave of Wonders, and Belle’s appearance must be after she finally gets to leave Beauty and the Beast’s ‘provincial town’ – making Beauty and the Beast the earliest of the three and Aladdin the latest. In prison, personal grooming is the first thing to go. Also, the ‘I’m free’ guy of The Hunchback of Notre Dame may be a fan favourite, but the similarities between him and Jafar’s beggar disguise make him suspicious. While the guy must have been locked up for something, Frollo’s Paris is so unjust it’s easy to believe he could have been unfairly imprisoned, and his consistent failure at escape is what hardens him in to the amoral Jafar (meaning ‘Jafar’ is the disguise, and this is his true appearance). Genie painting with all the colours of the wind. Genie displays many of anachronisms (and whatever the dimensional version is – see his references to our world) typical of magical characters in the Disneyverse. His appearance in Aladdin and the King of Thieves does not mean Pocahontas is set in the same time period; instead it’s an insight in to how users of magic in the Disneyverse can access different times and places. Genie’s schizophrenic persona may not be from centuries trapped in a lamp (though that can’t help), but could actually be a symptom of the madness that Disney’s magical characters suffer thanks to their ability to perceive events outside of a linear timeline. For a lamp that hasn’t been rubbed in centuries it really keeps its shine. Four centuries later, we still see Carpet and the lamp turning up wherever the magic is. The fact that voodoo-priestess, Mama Odie has it could mean many thing: it could be Genie’s old lamp, or another genie’s lamp, or, Odie is yet to reach through the timeline and place it in the Cave of Memories for Aladdin to find. Many magic users in the Disneyverse seem to look through time, so with these artefacts constantly reappearing throughout time in impossibly good condition, perhaps it’s possible to reach through it as well. 11 to 20 – aka.